Apple has announced its latest gen iPod touch, a notably slimmer-looking device than its predecessor, featuring the Retina display currently only seen on the iPhone 4. 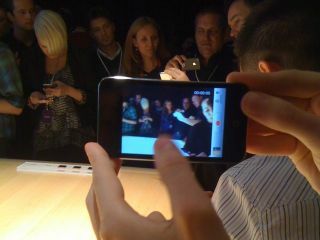 Apple's latest gen iPod touch also gets two new cameras and will run Apple's FaceTime video calling app. Users will be able to make FaceTime calls between other iPod touch owners, as well as with friends and family with iPhones. Steve Jobs announced that over a billion and a half games and entertainment titles have been downloaded to the iPod touch alone. The new iPod touch launches next week and will be available for pre-order over on Apple.com shortly. "It is the strongest line-up of iPods that we have ever had," enthused Jobs. Cost to you? £189 for the 8GB model, £249 for the 32GB model and £329 for the 64GB model. Hands on details to follow.